Si hanno notizie confuse su questa marca. La Moto Aquila Super risulta essere di Luigi Monteverdi e C. e nella società partecipa anche il figlio Annibale. Su progetto del tecnico piacentino Ferruccio Fortina, che forse ha una parte attiva nella società e che ha lungamente collaborato con la Mondial del Conte Boselli, vengono realizzate dal 1953 al 1955 motociclette con motore, forse di propria costruzione, di 175 cc monoalbero e di 160 cc a due tempi. I motocicli vengono realizzati nelle versioni Turismo, Sport Lusso e Gran Sport. Moto Aquila partecipano a gare di durata come il Motogiro d'Italia e la Milano-Taranto. Established in 1926 or 1927, the Cavani company built motorcycles under the Aquila marque powered by DKW, Rudge Python and other engines until 1935, when Musolini's fascist government prevented free trade. Valerio Riva of Turin raced with them from 1932 to 1935. He rode Aquila in the 1932 Spanish GP at Bilbao (the first Spanish GP) in the 250 class, and on the following day in the 500cc class. Riva placed 2nd in the August 1935 Nice race, 350 class. A 1933 Aquila Invicta 175cc Super Sport has an OHV 4 Valve engine with a pushrod tunnel which gives the impression of OHC. The frame and forks are pressed metal. 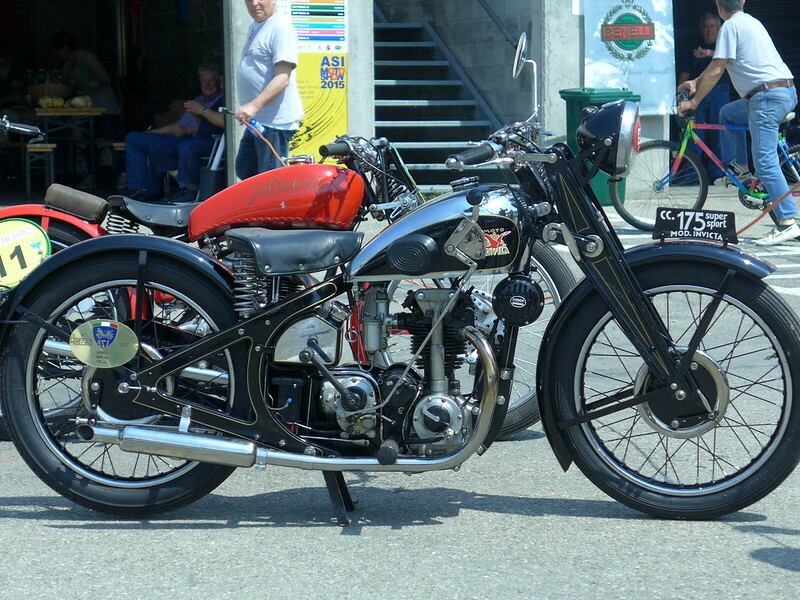 The 1934 Aquila Rudge is a quite remarkable looking racing machine - it has a pressed metal frame and forks both liberally perforated. Other models are believed to have used 497cc Kurchen engines along with those of OBM, a little known Italian manufacturer. Post-war, the name was used by an unrelated company in Rome established by Luigi and Monteverdi. Between 1953 and 1955 (1) they built motorcycles with SOHC engines of 175 cc and 160 cc in Turismo, Sport Lusso and Gran Sport versions. Moto Aquila participated in endurance races including the Motogiro of Italy and the Milan-Taranto race. There was an Aquila Italiana automobile famed for its use of aluminium pistons as early as 1908.